As a kid, the holiday season meant popcorn time! I would look forward to when my parents would bring home those giant tins filled with an assortment of popcorn flavors. By Christmas would have more popcorn tins than we knew what to do with. I guess those were the go-to gifts of the 90s. Back then there were three main flavors: butter, cheddar, and caramel. While those flavors will always remain popular, popcorn sold nowadays are more exciting and adventurous with their flavor profiles. From curry spiced popcorn to jalapeño cheddar popcorn, there is a combination to satisfy any snack craving. Peppermint Bark is one of my favorite holiday treats! I look forward to the time of year when it is acceptable to eat peppermint in every which way (peppermint hot chocolate, peppermint ice cream, peppermint lattes…). I’ve translated the components of peppermint bark into a delicious caramel popcorn mix! 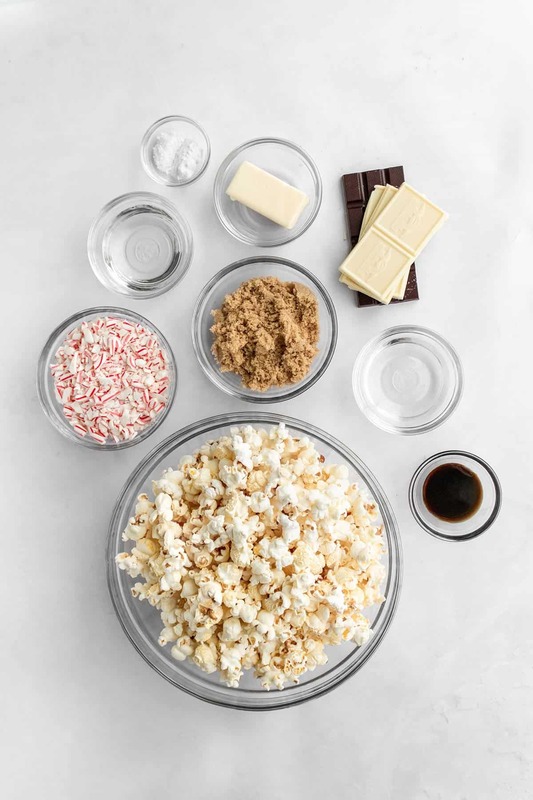 You get a little of everything with this- plain popcorn, caramel popcorn, a little bittersweet dark chocolate, silky and creamy white chocolate, and crunch from the crushed candy canes. It’s a party in your mouth, it’s a dance for your taste buds, and it’ll make you merry and cheerful. 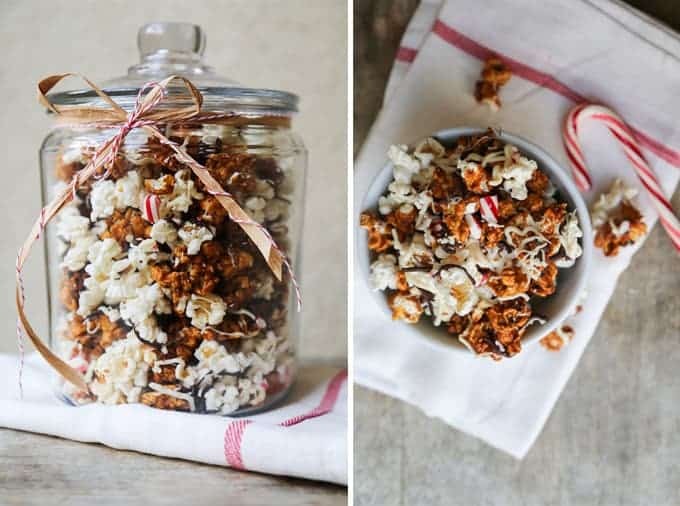 My favorite part about this popcorn- they make wonderful DIY homemade gifts! Watch out friends, you may be receiving one of these soon! Preheat oven to 250 degrees F. Line baking sheet with parchment paper (or Silpat non-stick baking mat) and set aside. Place 10 cups of popcorn in the largest bowl you have. Set aside remaining 6 cups of popcorn in another bowl. 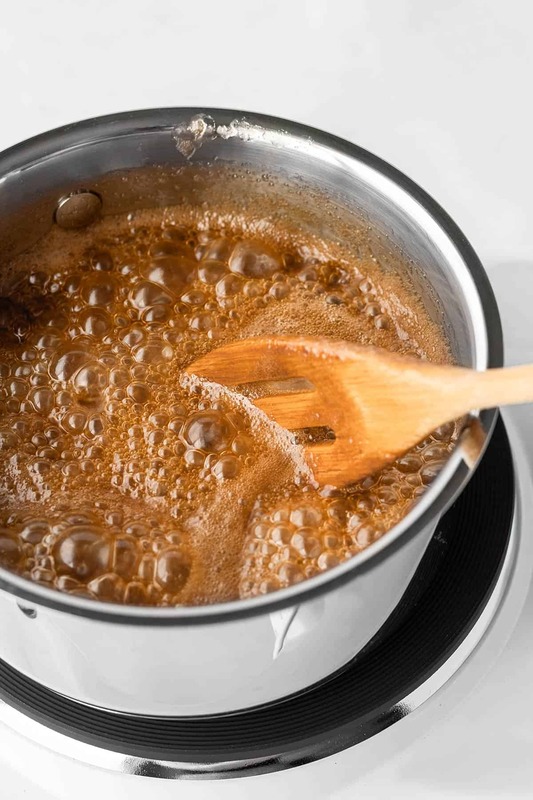 In a heavy bottomed sauce pot, combine butter, brown sugar, corn syrup, molasses, salt and water. Set over medium heat to melt butter and sugar. Using a candy thermometer (or food safe thermometer), cook to 250 degrees F. Stir mixture as needed to ensure even cooking. Once desired temperature is reached, remove from heat. Add baking soda and vanilla and whisk to combine. (BE CAREFUL when adding baking soda, as caramel mixture will bubble up and rise! Pour hot caramel over the 10 cups of popcorn. Using a large spatula, fold to distribute caramel among popcorn. Spread caramel popcorn into an even layer over prepared baking sheet. (If necessary, use more than one baking sheet if popcorn does not fit.) Bake for 60 minutes, stirring popcorn every 20 minutes to ensure even caramel coating. Combine caramel popcorn with reserved 6 cups of plain popcorn. Spread over a large baking sheet. 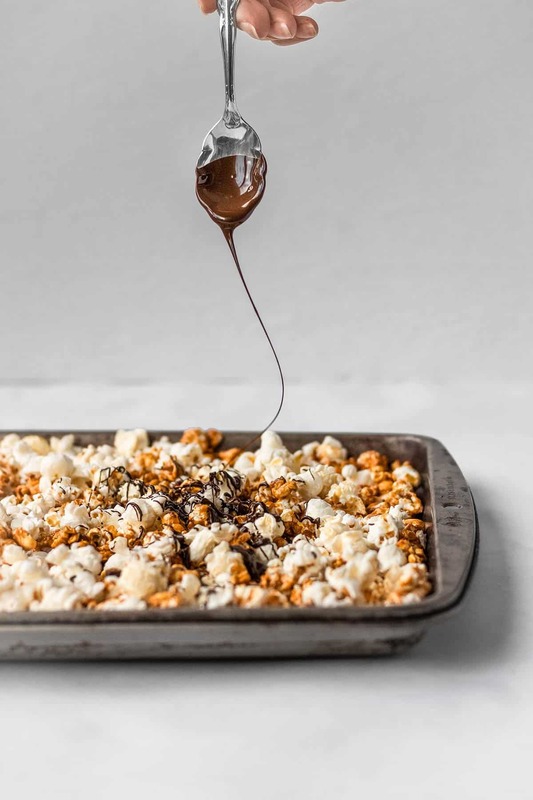 Drizzle half of dark chocolate over popcorn. Follow by drizzling half of white chocolate. Sprinkle half of crushed candy canes. Let chocolate set. Once chocolate has hardened, toss popcorn together. Spread into an even layer and drizzle remaining dark and white chocolate and crushed candy canes. Once chocolate is set, toss together. Store in an airtight container.